While reading a book can be an especially personal experience, breaking the book down to its essence—its spices and herbs, if you will—is best done with a group. Since March 2010, the Slow Food Utah Book Club has read one food or food-policy book a month, which culminates with a scintillating discussion and potluck—with some dishes inspired by the current book. Some readers are regulars, others first-timers. Here, it’s OK to be a slow reader. It’s a well-known fact that Utahns love their burritos. At Lone Star, we’ve got the choice of 16 massive burritos, which come with everything—“and we mean everything,” the menu proclaims. Tucked away in Cottonwood Heights, this beach-style structure houses fresh, authentic south-of-the-border flavors ranging from tamales, mahi mahi fish tacos and, of course, the aforementioned burritos. Throw in some cold cervezas served in a glass cowboy boot, and you’ve got yourself a certified locals’ favorite. Canning isn’t just for grandmas anymore. With classes named Drunken Cherries, Bloody Mary Bar or Saucy Summers, the goals of the Pickled Canners Club come into perspective: that food preservation is better with booze and friends. The crowds that made it to the several classes during the club’s inaugural season learned food safety and canning basics while noshing and imbibing. If that’s not enough, the real payoff happens comes winter, when the smell of summer can be breathed in from the canned consumables. 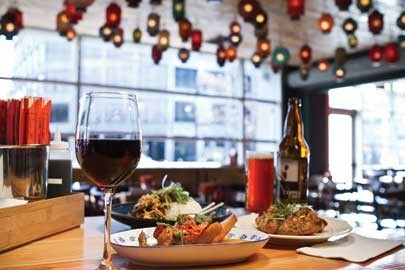 Buoyed by the success of The Copper Onion, owners Ryan and Colleen Lowder decided to branch out by opening Plum Alley, bringing pan-Asian fare to downtown Salt Lake City, along with a fun and funky atmosphere. Communal dining is the order of the day at Plum Alley, where strangers often become friends and find themselves sharing plates of steamed pork buns, spicy larb salad, killer curries, coconut-milk-braised short ribs and the delicious ramen. Salt Lake’s best new restaurant is plum terrific. There’s an old adage that goes: “You can take the man out of the South, but you can’t take the South out of the man.” And some folks don’t even need to be from the humid Southern climes to have the South in them—like Dave Mathison, owner of Chris ‘n’ Dave’s Boiled Peanuts, who serves up his original and Cajun-flavored treats at the Downtown Farmers Market every Saturday. His boiled peanuts are fresh, so they’re succulent and addictive, unlike the soggy, brined, boiled-in-the-shell varieties found at gas stations throughout the South. Come to think of it, maybe it’s best he’s not from the South. Salt Lake City’s local and independently owned “sammie” shop gets a lot of hype year after year, and for good reason. Every day at lunch, Toaster’s three downtown locations are packed with patrons gladly waiting in line for classics like the toasted turkey & avocado sandwich or a Toaster’s Rueben. With a nice selection of soups and sides and a friendly staff willing to customize an order to your heart’s desire, Toasters has the sandwich game locked down. After a few years of obsessing over how to unlock the superfood benefits of cocoa beans in a hot-brewed drink, Crio BrÃ¼ owner Eric Durtschi created a gem of a beverage. Although it might garner comparisons to coffee—it’s brewed the same way—the caffeine-free concoction is something unto itself. The drink is slightly bitter and highly aromatic, and the longer Crio BrÃ¼ steeps, the richer and more chocolate-y it becomes. Durtschi had to invent the roasting, fermentation and processing methods, so it’s more than a new drink—it’s a drinking revolution. It’s common knowledge that, like a trout to a nymph, a fly fisherman is drawn to water. Lucky for us, caster Justin Gumm and co-owner Krissann Smith nestled their little pub and pizzeria next to the Ogden River. Along a stretch of the parkway, the patio is perfect for drinking something from the establishment’s beer list—unrivaled in Ogden, with 10 beers on tap and more than 100 bottled beers—eating some of the Wasatch Front’s best pizza or listening to a local singer-songwriter. With lush trees and the babbling river nearby, drinking a beer along the busy main street is surprisingly pleasant. A semi-permanent covering was recently built on the patio, which means more chillin’ all year. The Soup Kitchen has been one of Salt Lake City’s favorite lunch spots for years. Known for its homestyle classics like chicken noodle and cheese & broccoli, The Soup Kitchen is well-versed in the science of soupology. But it’s also a great place for sandwiches like BLTs, egg salad and even sloppy Joes. Locals also love the giant breadsticks and laid-back retro atmosphere. Led by volunteer director Mercedes Zel-Pappas, the Utah Co-op is as interactive as it is thrifty. Daily on its Facebook profile, the co-op asks its customers what they want, because, after all, it is their store. Unlike typical cooperative markets, this volunteer-run one doesn’t charge membership fees. And here, the customer is always right: They are the ones who stock the shelves, so to speak—at least 80 percent of the hundreds of items were requested by the customers. There was a time, before Diners, Drive-ins & Dives helped blow up Pat’s to national stardom, when visiting the rib joint felt more like you were going to buy drugs, requiring taking a nondescript side street down to the practically unmarked building to pick up a guilty fix of the best barbecue around. But with its ever-increasing popularity, live bands and still-unbeatable barbecue, Pat’s is now less a guilty pleasure and more a happy routine. For those seeking the tastiest smoked offerings from ribs, chicken and pulled pork to daily lunch specials like barbecued meatball sandwiches to the burnt ends that pack the house on Fridays, Pat’s is your hookup for the best in barbecue Utah has to offer.